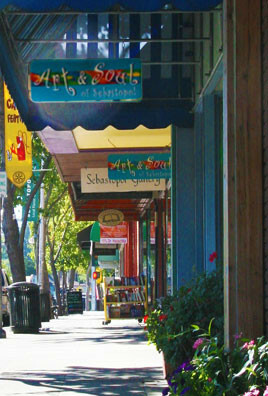 The City of Sebastopol is a small semi-urban community located in California, on the western edge of the Santa Rosa plain. It is 50 miles north of San Francisco, 8 miles west of Santa Rosa, 10 miles from Bodega Bay, and about 15 miles from the Russian River. The City, incorporated in 1902 currently has a population of about 7,800 people. There is a diversity of housing types in the Sebastopol area, ranging from 100-year old Craftsman bungalows and farmhouses to modern subdivisions, apartments and condominiums. In the countryside surrounding Sebastopol, properties with vineyards, apple orchards, redwoods, streams and other features are not uncommon.